/ “Alive After the Fall” Review – Prep or Flee? A new video is making the rounds among Christians, except its contents are nothing new. While I say that about a lot of prophecy theories people email me about, in this case its true in an additional strange way. As you watch Alive After the Fall, you may be reminded of another video from early 2015. That video was the Survive the End Days by someone under the admitted pseudonym of "Nathan Shepard." He called himself a archaeologist and theologian at a large university in New Haven, Connecticut. This time his name is "Alexander Cain," who is also an archaeologist and theologian, this time from a large university in Arkansas. "What you are about to see is deeply disturbing…"
America is the doomed Mystery Babylon/Daughter Babylon of Revelation and Jeremiah. Obama and Putin are the dueling King of the South and King of the North from Dan 11, respectively. Therefore, before Obama leaves office January, 2017, Putin will attack America. The "weapon of his indignation" he uses is an EMP or electromagnetic pulse which can paralyze the whole continent leaving it in the dark. The author has lived among the off-the-grid communities around the world (like the Amish) where he learned how to live without electricity like they do. To be sure (unlike many Christians) I have no problem with a Christian selling a book teaching the Bible. I sell my own ebook and book explaining Bible prophecy for those who want help making literal sense of it. Selling my one complete book on Bible prophecy makes it possible to write the many articles on prophecy like this one, all for free. Instead, the problem I have is with the advice given at the Alive After the Fall website and in the ebook. The assumption of Alive After the Fall is that you need to save yourself from destruction of America prophesied in Revelation and Jeremiah. His ebook gives prepping and survivalism advice based on this assumption. Rev 18:4,8 (ESV) — Then I heard another voice from heaven saying, "Come out of her, my people, lest you take part in her sins, lest you share in her plagues"... 8 ... she will be burned up with fire; for mighty is the Lord God who has judged her. This verse is often misunderstood because the context is forgotten and not taken into account. You cannot understand the words "come out of her" properly without the context. What is the context? Revelation 18:4-8 depicts what John hears as he is viewing America the Babylon right before she is destroyed. While surrounding verses talk about America's destruction and what happens after that in the world, the command to "come out of her" is obviously heard by John right before America is destroyed. This means that in the future when America is about to be destroyed, a command from heaven will be delivered to God's people telling them to flee Babylon (Rev 18:4=Jer 50:8; 51:6, 45). Of course the way God sends messages from heaven to earth is through his human prophets. That's how it will come. By the way, since moving out of your home country is a very hard undertaking, we can be sure God will help us. He provided miraculous help when he told ancient Israel to come out of Egypt. Revelation predicts the same thing for when the righteous flee the end times events (Rev 12:14=Ex 19:4). 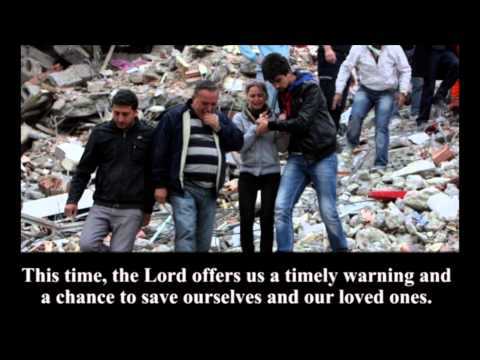 We won't be saving ourselves; we'll be following his instructions to be a part of the plan he already has to save us. Anyway, Revelation 18 is not telling us to flee America now; it's telling us what God's solution is for his people in America when it is about to be destroyed. Just like he did with Lot and his family before Sodom was destroyed, God will warn the righteous in America to flee before it is destroyed. Revelation's prophecy of a command to flee plainly contradicts the advice of Alive After the Fall that you should prepare to stay in America by learning survivalism. The site quotes many verses in Revelation 18 and completely misses or ignores this very important verse 4. What About America's Destruction "by 2017?" OK, so his advice to learn prepping is clearly way off and his biblical scholarship credentials are suspect, but what about his prediction for WWIII by January 2017? At this point, do I really have to address that? 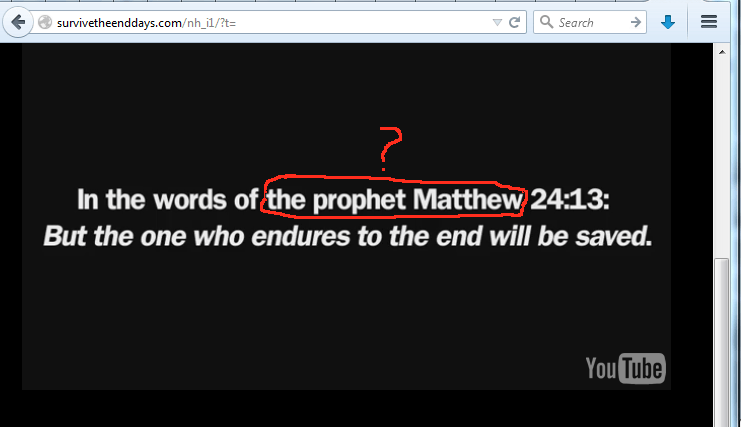 =) Does he have any credibility left on interpreting the Bible after that? Even if he did, the real issue here is that no man, short of a prophet, is able to predict the future. The author gives no prophet credentials. He's just using Bible prophecy but Bible prophecy does not tell us the exact timing, as Jesus said, no man knows the time of his coming (which you could work out from the fall of America if you had that time). Still some think maybe there are exceptions, especially when they are listening to people who make really convincing arguments. If that's you, then an article with a clear reminder of the basic truth that people can't predict the future may be helpful to you. I trust this article (and the related linked articles) has helped you find comfort about the 2017 doomsday prediction and very difficult advice of Alive After the Fall. How can I get a hold of the book,Alive after the fall.